Oxydrolone is a powerful anabolic and androgenic steroid from an Indian pharmaceutical company. The main active ingredient is oxymetholone. Form release – 50 tablets of 50 milligrams. The steroid was developed in the 60s of the last century by Syntex Laboratories. Like most sports pharmacology, oxymetholone was originally used for medical purposes – for the treatment of anemia and osteoporosis, as well as to stimulate muscle hypertrophy in debilitated patients with nutritional problems. But after some time, more effective drugs were created, and today, oxmietolone is used primarily in sports. Perhaps he would have disappeared altogether if not for the latest research that showed the effectiveness of the steroid in the fight against HIV infection. 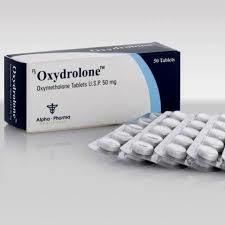 Oxydrolone is one of the most powerful oral medications: its anabolic activity is 320% of testosterone, androgenic – 45%. Steroid is not prone to conversion to estrogen, but in itself has an estrogenic effect. The duration of the drug is 15 hours, the detection time on the doping control procedure is up to two months. Oxydrolone is advisable to use in the preparatory period, but professional athletes, due to possible out-of-competition verification, use the steroid at their own risk and peril. Severe muscle hypertrophy. If you are not a competing athlete, then you can safely take Oxydrolone, as there is no more effective oral steroid for increasing muscle volume. With a certain genetic predisposition, an athlete is able to add up to 15 kilograms for a solo course. And even despite the tangible phenomenon of recoil, which, most likely, will take from you 15-30% of the recruited amount, the effect is still very, very significant. Decreased globulin concentration. The effect can significantly increase the effectiveness of steroids used in the course in conjunction with Oxydrolone. According to research, the intake of this steroid even to people who are not subjected to physical exertion allows you to gain up to 5 kilograms of muscle mass. Moreover, the experiments showed that users not only increased muscle volume, but also significantly reduced the percentage of body fat (especially in the abdominal area). The use of steroid within reasonable limits does not disrupt the liver.